Murad is founded on the simple truth that living younger is a choice you can make every day. We believe that youth is a reflection of how you feel, how you look and how you live, because every aspect of your life is as interconnected as every cell in your body. That’s why everything we do at Murad is designed to help you activate youth through hydration at the cellular level. Murad Hydrating Toner - 6.0 oz. - Murad Resurgence - Alcohol-free toner replenishes lost moisture to refresh skin and prepare it for treatment. Provides a lightweight mist that rehydrates while restoring skin's natural pH balance and neutralizes surface impurities. This hydrating toner balances, hydrates and neutralizes surface impurities. Lecithin helps lock in moisture and restores suppleness. A perfect way to prepare skin for treatment. How to use: AM and PM. Apply evenly over clean face, neck and chest. Follow with a Murad Step 2 treatment. " HYDRATING TONER TO REFRESH AND PREPARE: Resurgence Hydrating Facial Toner is a lightweight mist that rehydrates and refreshes skin while restoring skin's natural pH balance and neutralizing surface impurities, readying your skin for better penetration of your other treatment products. RESTORE YOUR SKIN: Help recapture the youthful look of your skin with this hydrating, alcohol free toner rich in Lecithin, Grape Seed Extract, and Osmolytes that help bind water to restore the skin's suppleness and regulate water balance for optimal hydration levels. NATURAL EXTRACTS TO FIGHT SIGNS OF AGING: The peach and cucumber extracts in this toner soothe and minimize skin irritation without overdrying skin like other harsh alcohol-based toners. Allow the natural rejuvenating effects of these extracts to help combat hormonal aging, deep wrinkles. loss of elasticity, and dry thinning skin. WHAT ELSE DO I NEED? 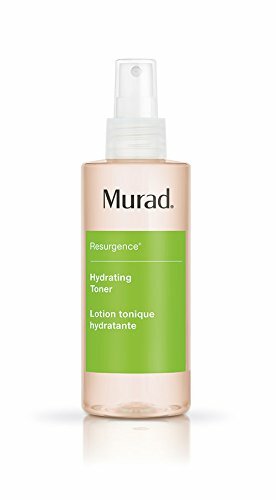 : Resurgence Hydrating Facial Toner is recommended as the Step 1 cleanser in any Murad Acne regimen as part of Dr. Murad's inclusive health system of care. Pair with Murad's Renewing Cleansing Cream, Intensive Age-Diffusing Serum, and Age Balancing Moisture SPF 30 PA+++ for optimal results.